The romantics love Paris in the springtime, but what’s more beautiful than Paris in the fall? Some of us have already seen snow, and many of us are still enjoying the fallen leaves on the grey sidewalks of city streets. 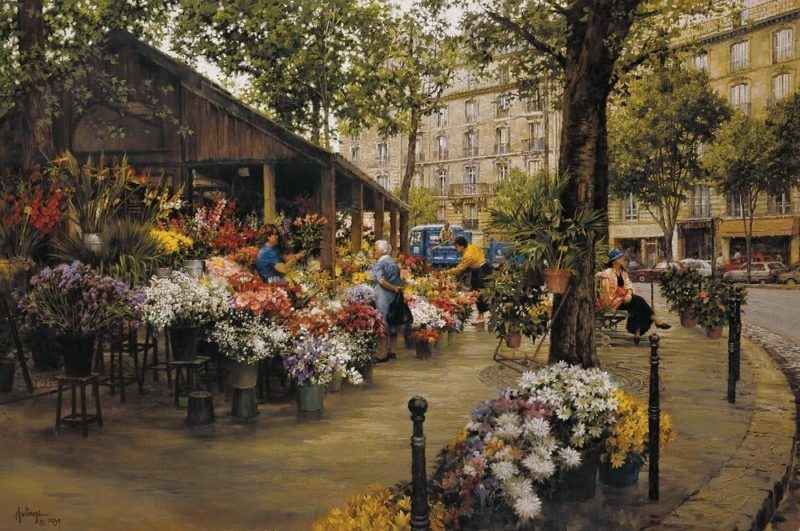 Flower markets are signature subject matter for Clark Hulings—the Place des Ternes was a favorite spot, located between Paris’ 8th and 17th arrondissements, and it crops up many times in his work. Colors in this 1995 painting are incredibly vibrant: they’re high-contrast and set off against the dark accents of a rainy day. We especially see the yellows, which are at play in the cut flowers, the playful scattering of the leaves in the foreground, and even in the lady walking away from us in the background with her matching coat and umbrella. 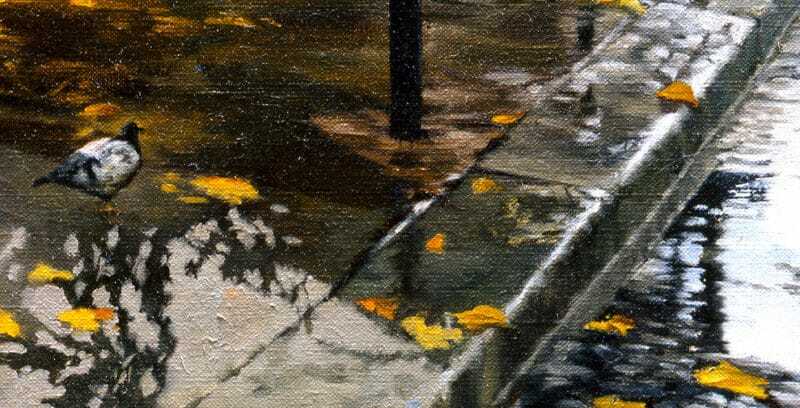 There’s some particularly interesting, almost abstract painting in the slick of water to the right of the flower buckets, spilling into the puddle on the cobblestone street. Hulings loved rainy days precisely because he could push the values to increase more vivid colors without making the result too garish or harsh. He could also double the color by reflecting it in those puddles. The tree trunk in the foreground is an anchor for the corner that points right at us, and you can almost feel the motion as the curved street peels away to the blue van on the right. It looks like a business-as-usual day in the city of lights: the most visible traffic light is green for “go” as vendors tend to their shop, customers buy flowers, and pigeons march around importantly as they do all over the world. 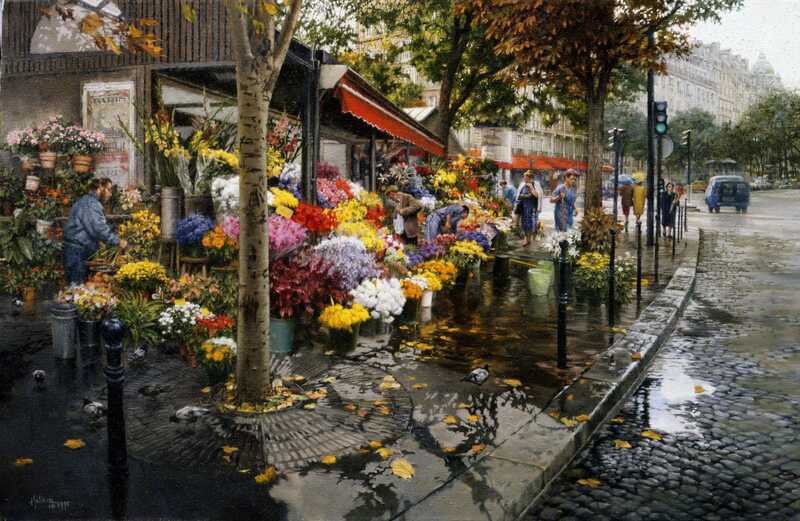 We have a similar Place des Ternes painting available as a signed archival print in our store. It’s a perfect time to do some holiday shopping for the Francophile or gardener on your list.